The new PMD-B200 Blackbird II from Alpine brings some coolness back to the portable navigation market. 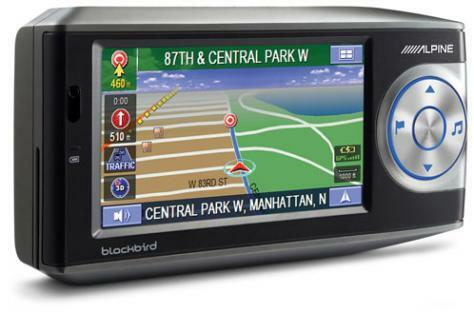 It offers a nice, bright touchscreen with an easy to use control pad for zooming in and out of maps, working the navigation menu, activating the music player and punching up bluetooth functions. The unit offers both text and voice-guided directions for the US and Canada with 2D and 3D maps. It’s compatible with NAVTEQ Traffic RDS service (costs extra) which provides real time traffic data, filtering and auto-detouring. The bluetooth functionality allows you to both make as well as recieve calls from bluetooth-enabled phones as well as sync address books. It’s a nice touch to have hands-free calling available in states such as New York and New Jersey with handheld bans. Being a product from Alpine, of course the unit has solid music offerings. The built-in SD card slot allows the playing of MP3/WMA tracks either through headphones, the speaker incorporated with the device or through your cars system via the FM transmitter.